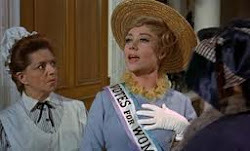 Mrs. Banks goes to Convention: In Finland, men can't be President. My niece is about to sit the Higher School Certificate and finish school! Wow! Gee they grow up in the blink of an eye and she will be 18 this year. Over the years, it didn't matter what we were speaking about, she had no concept of an applied gender differential. 'Anyone can do anything' seemed to be the way she approached life. But it hasn't always been this way for women in our world, and still isn't. Michelle Bachelet came to Canberra and reminded us how it isn't and in what ways. So let's go back a step: Michelle Bachelet is the Executive Director of UN Women, and an Undersecretary of the UN. She has also been the first female President of Chile. She is truly global person, having lived several careers, has a mantle covered in awards - all whilst being a single mother of three children. Michelle was meeting with the Australian Government and AusAID in preparation of attending the Pacific Island Forum with Julia Gillard and Hillary Clinton. Whilst in Canberra she snuck in a quick speech - probably the same one she presented at the Zonta International Convention. "100 years ago only 3 countries allowed women the vote. Australia was one. Now in every country people continue to stand up for equality"
Why UN Women is still needed, using lots and lots of stats and stories. Basically UN Women was formed from UNIFEM and a couple of other parts of the UN to create a body which works quite differently. Instead of organising and supervising projects targeted for women and girls (the work of UNIFEM), UN Women uses a gender mainstreaming approach. It seeks to co-ordinate the other UN agencies to ensure all their policies and projects are gender neutral and do not generate perverse outcomes for women and girls. In this way, gender issues are no longer silo'd within one agency, but there is the opportunity to embed outcomes across the board. Huge leap forward - as long as the other agencies agree to play along. And so why is UN Women, and by extension Zonta, still needed? According to Michelle, 1/3 of all women will experience domestic violence; women still do the vast majority of unpaid work; women on average earn less than men. Even though 125 countries now recognise domestic violence and have made it illegal, 600 million women live in countries where it is not recognised. And for those women neither do they have land rights, travel freedom, permission to sign a contract or borrow money, or receive an inheritance. Even here in Australia where we have a wonderful life, still only earn roughly 85% of the average of men's salaries; only 1/3 of our pollies are female and women make up less than 10% of ASX top 200 company board members. How can balanced decisions be made in these circumstances? The Australian Government has a target of 40% female participation in government appointed boards, committees and panels - and we are not there yet. In France they have a saying: "If a woman becomes involved in politics, she is changed. If lots of women become involved in politics, the policies are changed"
Michelle asks how can people make good decisions if participation is not 50/50? She points out that women's participation in peace talk negotiations has been less than 10% of the participants, and that peace talks, on average, fail within 5 years. And that research has shown that the most important success factor for a child is the education level of the mother. That when the economic status of women is advanced, women are more likely than men to put their money into their family and reduce hunger rates, reduce illness, increase education rates of children and this generates more jobs in the local economy. So let's take a break and you can see this short video, filmed by AusAID, (with Canberra in the background). Michelle speaks of Australia's foreign aid program and support to UN Women, and some of the successes of the UN Women programs. 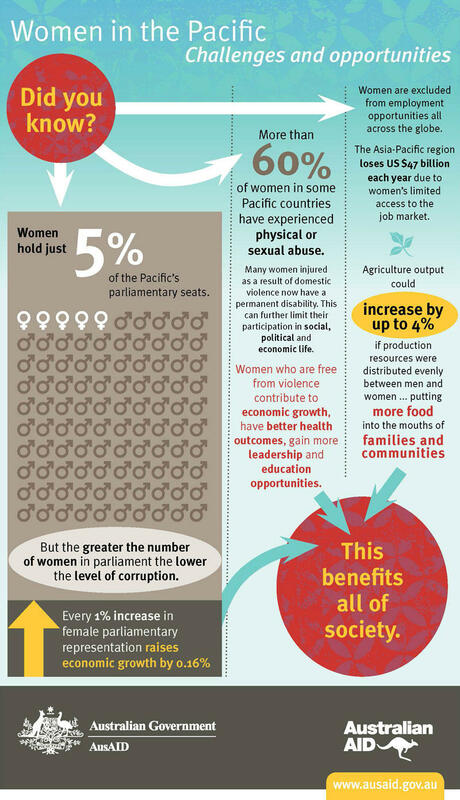 1/3 of Australia's women experience domestic violence, but in the South Pacific it is 2/3rds! And the UNHCR has pronouced that the Solomon Islands has a rate of domestic violence that is pretty much the highest in the world. In Australia, we average 1/3 of our pollies being female, the South Pacific is less than 5%, and in some countries it is 0%. Michelle came to recognise Australia's foreign aid contribution to turning around this situation. Australia is one of only 2 countries in the world to be growing our foreign aid budget, to now $7.5 billion. And an increased chunk of it is heading towards the South Pacific women's projects, such as their "Women leading change" program, aimed at increasing the number of women as parliamentary representatives. "In Finland, A woman was head of state for over 12 years (Tarja Halonen), and she was visiting a kindergarten asking the kids what they wanted to be when they grew up. She was getting the usual answers: a doctor, a teacher, a fireman. She asked one boy: "Would you like to be President one day?" and the boy replied "Men can't be president!". Michelle closed by saying this story made her realise: in changing mindsets, role models help more than policy. So gentle reader: who have been your role models for advancing the status of women & how have they changed your mindset and driven you to action?